Well here I am back at Cedar Farm with a pot of spicy chai. I am wondering if you have been taking any action on your theme in the last day or two? In the (ammended)words of your favourite West Wing quote "I fear that you may be putting too much faith in the power of a new notebook [shirt]. Or not. Remember this notebook I bought when you were here? 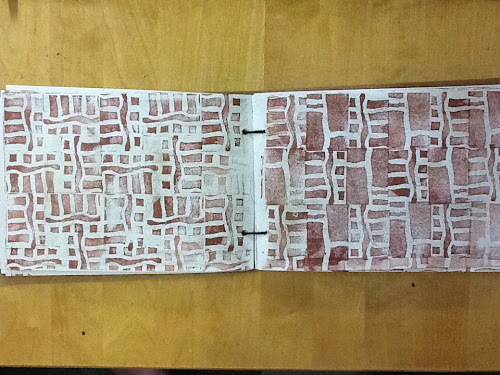 It is totally unsuitable as a sketchbook. It is too beautiful to want to mess up. Too small for any expansive work. The paper will not withstand any kind of wet media. And yet.... I just decided it was asking to be filled with work about African Ladies. So I started working on the Finding Your Own Visual Language exercices and...... I can't stop! I really feel that I am making a breakthrough. I believe the difference from when I have tried some of these exercses in other classes before is the use of a theme. I really struggle just making random samples and collections of marks. What are they FOR?? I get irate at the waste of my time. But this time, the focus and intent, combined of course with the power of a new notebook seems to be working. 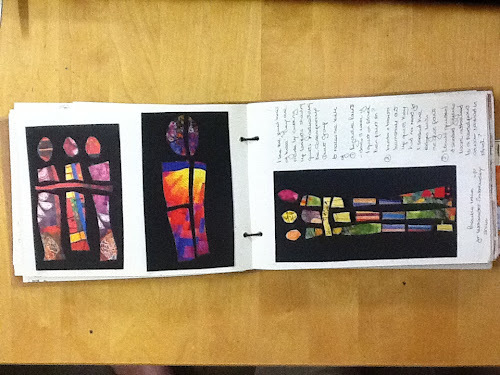 Here are some of the pages. First I played with exploding shapes. Then I looked at the lines between the exploded shapes and made positive and negative stamps. I am quite excited about the posibilties here for a contemporary block quilt. You know how I really like the African Kuba cloths and how the patterns morph - I can see that influence here. So I would encourage you to just get a beautiful book and start. 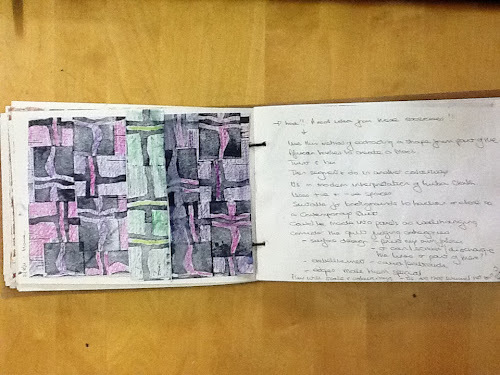 But whilst a new notebook seems to have considerable power after a while I need to get into fabric. So I decided to make maquettes. Not samples. I hate unfinished useless samples. These will be small quilts Finished. Saleable even, but basically fabric sketches on which I will try out ideas and try to push things onwards. This is yesterdays, finished this am in my PJ's before the houehold woke up. 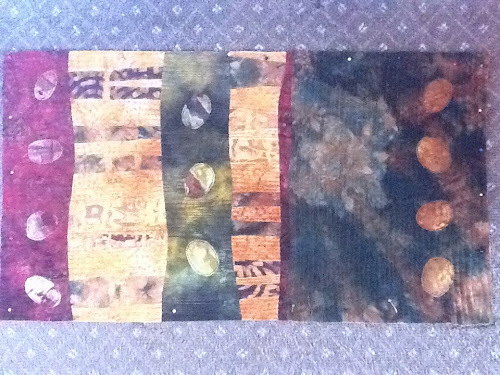 It is a bad ipad photo of it blocking on the carpet and it has washed out the colours but you get the idea. I like it as it is but I like it better for the ideas it gives me to alter it! I have been giving some thought to your question about what it is about African Ladies that entices me. A difficult question. I think is not about the simplistic shapes I have evolved as a resut of not being able to draw a more complicated portrait, but about the lives of the women. They are a way of accesing the stories of their lives and their cultures which to me seem so much more communal, vibrant and colourful that British Urban life. After I visited South Africa in the year Mandela was released I became very interested in all books relating to apartheid and the abolition of it. In the UK politics seems to be about money and the Westminster Village. In African politcs is about life and death. My challenge I think is to find a visual language which allows me to portray what I want to say about issues in a visual not verbal way. 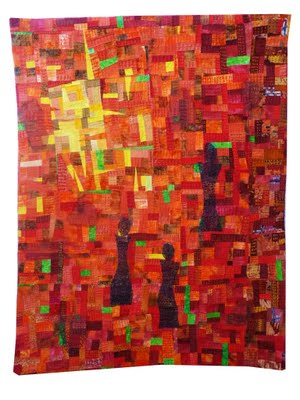 Pretty quilts, amusing quilts like Leaving the Accra Quilt Show are all well and good but they are a bit White Bread I fear. 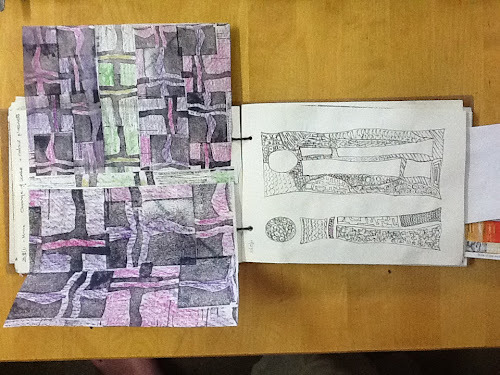 When I asked Dennis what he saw in the fabric sketch above he said, nothing really. " So you dont see the scattered bone and heads of women in massacre mass graves in Rwanda then? " He laughed. "No that's they way YOUR mind works." But I do see them. And that was what the ladies were telling me about even as I chopped them up and laid them down to rest. And if you turn it sideways with the maroon on top I see the mothers with their children at their knees linked to their dead and buried ancestors women. Hmm. I either need a new notebook everyweek or an appointment with a psychotherapist! I too found making myself concentrate on one theme ratherscarily limiting so my secondary theme is a rather nebulous Crossings, Boundaries and Transitions. Unsuprisingly I was also thinking in terms of images of maps and fences, walls as you mentioned being inspired by but really I am thinking about issues such as immigration, imprisonment and dislocation. 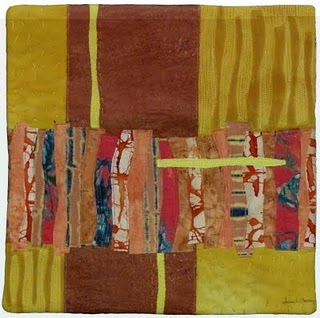 My SAQA auction piece Border Crossing was a start on this series. So enough about me. Why tea? And envolopes seem to have tons of potential for 3D and flappy kind of work. Would you say that you are most inspired by the things themselves or by the ideas they invoke? What is it really that you think stops you starting? Is it really time or is is fear and if so fear of what? I found it was helpful to think of it as a time limited thing. In my case told myself I was giving this topic sketchbook a chance until my studio is ready and if it was not working my then it was for the bin. Figurativey if not literally. After all it has a beautiful leather cover. Which matches the colours of the studio to be. This is not a marriage after all. Its not like you have do tea for the rest of your life. Oh another question for you: how important do you think ritual is in creative production? I was just thinking how coming here and having the same seat seems to allow creative juices to flow free. Finally, I found a new artist this week whose work I found very inspiring - . http://sophiemunns.weebly.com/ Check her out! Under the Homage to the Seed link she has her 2010 journal which is worth looking at. OK time to go and get another round of drinks in and look at some new books that arrived from Amazon this week. Wonder how that happened? thanks for opening up the access. Just wanted to say that I'm in a similar situation to you right now - sans studio. 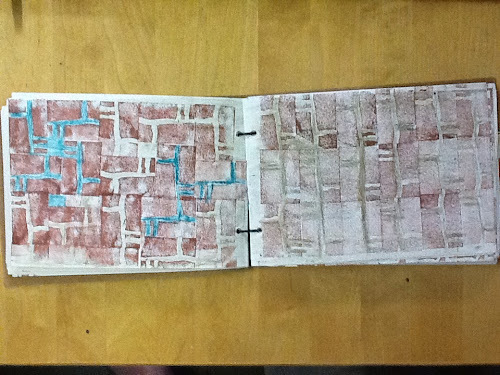 So I have signed up for the 2012 Sketchbook project. It might even get me into using a sketchbook more. 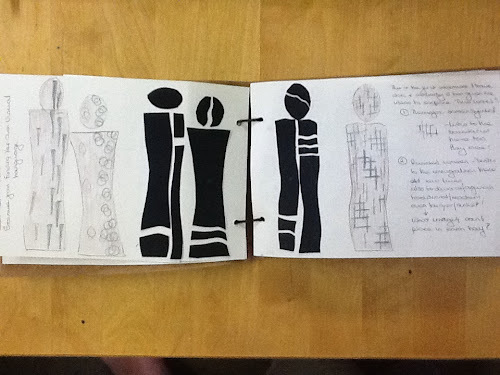 I shall be interested to follow your journey with the C2C Finding your Visual Language book. I have toyed with the idea of buying it, but not taken the plunge yet. I hope I'll form an opinion of whether it is for me by following your progress. 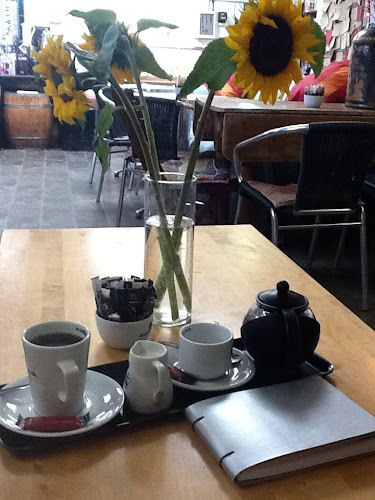 I'll be joining you with a cuppa here and eavesdropping - and maybe even joining in the conversation now and then. 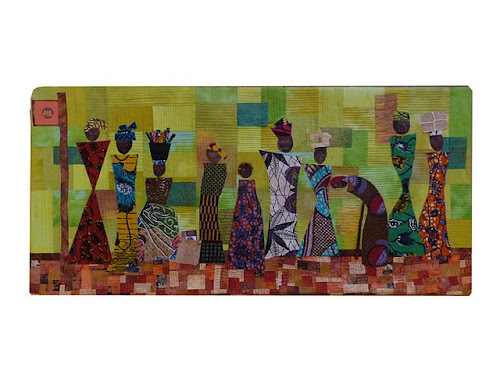 I've often wondered, Helen, why you focus so often on African themes in your work. I still don't understand the appeal for you - is it because the culture is exotic and thus different to yours? There are social inequities in many parts of the world but why have you zoomed in on these ones in particular? Helen! I am so impressed by all this most excellent work and thought. I love every page, sketch, line, stamp and detail. And then you went and did it in the cloth! Great job.